How many of us have had the opportunity to enter into hosting a day or a training (Art of Hosting style) without any design for the day, completely sensing into what is needed in the moment and fluidly dancing with five other hosts with offerings to meet what was emerging in the field moment by moment? How would you meet that invitation? Excitement? Trepidation? Both and anything in between? It is one thing to do this on your own or with one other person as Bob Wing and I did last summer in work we’d been invited into that turned into Hosting Ceremony. It is a whole other thing to do it with a new hosting team constellation of six of us on the third and last day of working together – in this case for the first Warrior of the Heart training completed in Brazil in January 2012. Warrior of the Heart is the work of Toke Moeller and Bob Wing coming out of many opportunities they had to jam together combining Art of Hosting and Aikido practices and principles. Playing together they imagined Warrior of the Heart training into being. I’d participated in a couple of Warrior of the Heart trainings – on Bowen Island in August 2010 and then at Windhorse Farm in Nova Scotia just this last October, 2011 with my 9 year old son. I’d also had the chance to work with Bob where Warrior of the Heart became a component of the Art of Hosting training we were delivering. In September 2011, after the Art of Hosting training in Porto Alegre, Brazil that I’d been co-hosting, Thomas Ufer, Najara Thamiz and I sat down with Jose Bueno and crafted an invitation to Bob and Toke to bring Warrior of the Heart to Brazil for the first time to seed the field for more and build the ground for the amazing expansion of the Art of Hosting and social change movements happening there. Working with a larger hosting team for a training the two of them were used to offering on their own invited Bob and Toke to some new learning edges. They invited the rest of us to go there right along with them. There was already a huge reservoir of trust in our hosting field even before we began. We built on it during our preparation and hosting time together. On our last day, it was Toke who invited us into the dance of hosting together without an agreed to advance plan. I felt in me my own skepticism at the invitation which arrived after morning practice, before breakfast, where we had actually invoked this flow already. I really wasn’t sure how it would work and whether we would all find our own place to play in this day – but I was willing to step into the challenge – because with this team there was nothing to lose and lots to gain. As the six of us stood in a tight circle on the stone patio outside the training building, a staff was in the centre with the challenge of who would take it first and offer something to the group to begin our day. Silence. A deep collective breath or two. I could feel the tremble in me. Another breath and then I reached for the staff. I had been preparing during our time together to do a teach with the sword – in this case the wooden representation of the sword – a bokken. Bob had been coaching me. 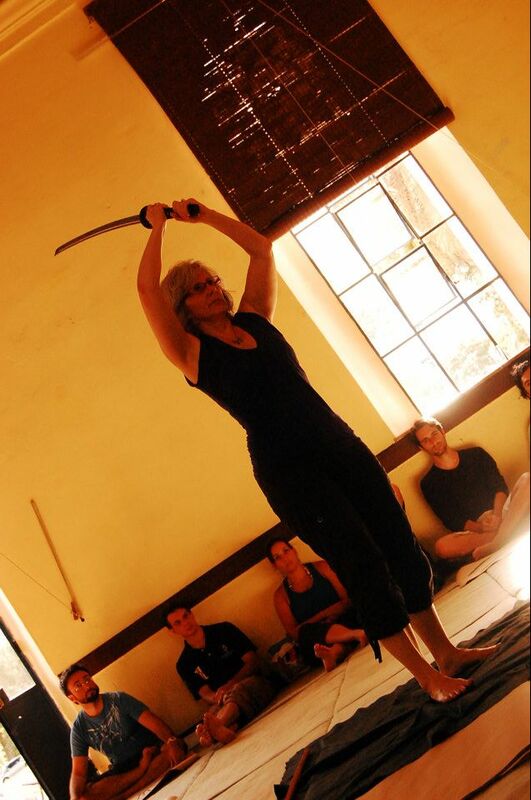 Perhaps because I was preparing to step into the challenge of a teach on something I was still very much learning myself, I had taken Bob’s feedback and coaching in in a whole new way, embodying the teaching and the sword movements with more fluidity and confidence than I ever remembered feeling. I had been preparing for a teach and this was apparently the moment it would be offered. I started the teach – the four directions – and forgot how to do the step to turn from one direction to another. Without being hard on myself, I asked Bob to step in and help — and he did because he had my back. All six of us had each other’s backs and none of us needed to shine or take up too much space and yet we were all invited to offer our brilliance when we felt the call. It was the beginning of a rich dance that included all six of us throughout the day. The experience was playful and fun and ended with a touching and powerful ceremony. The willingness to let go of control and design flowed into the Brazil Stewards Gathering that followed the Warrior of the Heart – in its own way and to its own degree because, of course, the team and the circumstances were different. But the fluidity of the dance was just as hesitant and joyful in its own way. I’ve been reflecting on what makes this kind of dance possible? One is definitely trust in the individuals and the collective of the team – knowing that each individual is there to serve the good of the whole and with no need to shine on an individual basis – although, as I mentioned above, of course each person does shine because of the gifts they have to offer in service of the whole. A sense of knowing when what I have to offer as an individual is exactly what is needed now. This is a complete dance with the subtle energies, with intuitive capacity. The courage to offer it when it is called. A certain level of trust or confidence in my own skills and abilities. A willingness to let other people shine in their mastery or even in their apprenticeship. It takes a certain level of maturity in each individual, the team and even in the field. Would I want to completely free flow it every time? I don’t think so. Every situation requires us to be tuned into what is wanting and needing to happen. Different situations will call out different things. And many situations invite a free flowing of design and offerings to different degrees. I and we are already practiced with working with emergence. Practicing to this degree honed my skill and my sensing capacity and invited me into new levels of mastery. It is embodied in a new way. It will always be with me – and with each of us. Having had the opportunity to host immediately after this experience, I know it’s in me in a new way and for that I am grateful. Looking forward to the next opportunity to dance in the ultimate emergent design – and to all the other variations of that that will show up along the way. Thanks Toke for the invitation and to Thomas, Narjara, Jose and Bob for being willing to dance the beautiful dance that shifted the shape of my hosting experience to new depth. What happens when what you are called into host is not actually what you’ve been called into host and every thing you think you know or have to offer of value is not what is needed? When knowledge and experience of methods, processes, theories and frameworks, though asked for, is not what will actually serve the situation or community you are hosting? These questions, alive and vibrant, were lived into this past week in Membertou, a First Nations Community in Nova Scotia, that a team of us had been invited to, as part of an emerging leadership program for youth, to offer a three day Art of Hosting and Warrior of the Heart training. We were invited by Pawa Haiyupis from the National Centre for First Nations Governance and a team at Membertou to contribute to a program Pawa has been envisioning for 10 years, since attending her first Open Space Technology session. We were to work with youth, elders and members of the Governance Committee. When the Canadian Government cut funding to the NCFNG in the middle of the four week emerging leadership program the plan was thrown into chaos and the shape of our time together shifted frequently and rapidly. Would there even be an AoH/WoH training and, if so, how many days and with whom? Financial and energetic support was invited from a circle of eagles from around the world and from the larger Art of Hosting community to fund expenses and to be at our backs as we hosted this work, the hosting team clearly called to be in it no matter the circumstance. The hosting team – Bob Wing, Pawa, Sarah MacLaren, Ryan, myself and one other – convened on the beach at Mira Gut to begin our check-in in ceremony and with a little Warrior of the Heart. Sense of spirit was strong with us and blood memories were being activated. We asked for guidance from Creator in this work. We did all the usual preparation for a training, including cracking our overall design and the design for day one. Then we entered day one. We knew as soon as we entered the space that we needed to be prepared to let go of much of what we planned as we waited the arrival of elders to begin our time together with a pipe ceremony. The pipe ceremony was beautiful and powerful, inviting spirit and Creator to guide our path. It had the full attention of everyone in the room no matter their age. We followed it with Warrior of the Heart and, yes, a teaching on the chaordic path and some time in triad conversations. In this day, we became aware of some disruptions in the field. At the end of this day, we met with the full hosting and calling team and explored what people were sensing and what their concerns were. We did a little teaching on divergence and convergence for this team. We invited all questions and all concerns and also celebrated a little bit the successes of the day. We left feeling a bit of convergence in this team and a willingness to be open to what wanted to happen the next day. Dinner with an elder showed us that what wanted to happen the next day was ceremony and, specifically a sacred fire. We all knew it was the right thing and in that moment the hosting team stopped designing process and shifted the most completely and fully I have ever experienced into hosting what wanted and needed to happen in this field and this community. It wasn’t process, methods, frameworks. It was ceremony. Ceremony in service of this community, hosted by the elders. Ceremony to activate blood memories. We trusted we would know in the moments following ceremony what else could be offered that would serve the community and the intention of this work well and we knew absolutely we were working with the principles of spaciousness and simplicity. Host team check-ins are always an integral part of any Art of Hosting training and usually serve the design process. In some ways, they became the design process. Deep check in. Clearing and understanding our field. Strong pull to meditation and other ceremony morning and night to keep intention and presence clear and strong. We know we were hosted in ceremony by this beautiful community. We know we also hosted, but exactly what is a little less clear. We know something happened in this community that would not have happened if we had not been there. We know something happened in us – individually and collectively – that would not have happened if we had not been there. I find myself in contemplation of ceremony and the guidance of Creator. I find myself in a deeper exploration of the non-physical world and the allowing of my gifts to emerge and flourish with new knowing and fuller surrender to what wants to be guided through me. In the letting go of expectations and any need to show “expertise” in this group and this community, I know we were more fully available in the co-hosting and co-creating of the space. Sometimes simply being allows things to emerge that might not otherwise. I am wondering how that informs all my hosting work and feel the invitation to work more and more from this place of surrender, trust and “just” holding space. A deep bow to the community, the team and the field that held us so well in this journey. Ten years ago, while in her mid-twenties, Pawa Haiyupis attended her first Open Space Technology training, meeting for the first time good friend and colleague Chris Corrigan who became a mentor. Unbeknownst to Pawa at the time, a vision began to take root: a vision of First Nations youth connecting back to elders and the land, bringing back ceremonies like rites of passage, naming and grieving ceremonies, language; essentially activating blood memories. We know when blood memories have been activated because we get little energy shivers in our bodies; the more powerful the activation, the stronger the shiver but even subtle little activations can have profound impact that reverberate in our awareness. Four years ago, Pawa began working for the National Centre for First Nations Governance (NCFNG) out of British Columbia, with a focus on youth leadership. During this time she also stepped more deeply into her own leadership journey through Art of Hosting and Warrior of the Heart, including a journey a year ago to Kufunda Learning Village in Zimbabwe. Her vision grew and began to take tangible form with the development of a Nation Rebuilding project piloted in the First Nations community of Membertou in Nova Scotia this summer focused on helping young people, ages 14-19, learn about identity and belonging, reactivating their creation stories, inviting the ancestors through ceremony and a traditional territories tour to guide this process. A combined Warrior of the Heart/Art of Hosting training was identified as an essential component of this work because it cultivates the conditions for emergence based on what each Nation knows. “I email you all with a heart request to help financially to keep the movement going and help bring this work to Indigenous youth in Membertou, Cape Breton Island NS. I know that financially at this time the world is in chaos. It is easier to give up which is precisely why I want to move this work forward. It is these practices (art of hosting and warrior of the heart) that help us lead in complex times with courage. It’s what is needed most. If the only thing the Emerging Leadership team does this year is finish this PILOT to be inclusive of art of hosting and warrior of the heart, it sets this work up to happen again in the future. “It is crucial that the art of hosting and warrior of the heart be included in the Emerging Leadership Program for reasons that you all know, it works when changing systems. The government cut NCFNG’s funding drastically days before the scheduled training was to take place. Training that I have been waiting years to happen. Either the art of hosting gets cut from the program or we find alternative resources to make it happen. This is where you come in. Eagles, with vision. We honour you by asking for help.” Pawa also made the initial personal contribution offer of $450 toward expenses of about $3,000 which includes Bob’s travel from Colorado. The Eagles have been responding with small and large offers of financial support and adding their individual and collective consciousness to this work which may set a pattern for what is possible in First Nations communities across Canada. We are broadening the call for support to the larger community. If you feel called, if you sense the power and possibility of activating blood memories, you could offer financial support here WiseActions.net and whether you can offer financial support or not, your holding this work from where you are and adding your conscious powerful intention for the highest good of the work, the people and the hosting team are all meaningful contributions. The last 2 weeks of this program are being combined into one. We will incorporate hosting and Warrior of the Heart with a traditional territories tour, naming ceremonies and community celebration. We will host and be hosted. As a hosting team, the work we have been pulled into is shifting literally by the minute. We will be called upon to be highly present, tapped in, resilient and resourceful to the fullness of our capacity as we hold this space with the people of Membertou. The response of the Eagles has already astounded the good people of NCFNG and of Membertou who are interested by and curious about this generosity of spirit from people they do not know. The response is also showing pathways to what’s possible when we think we don’t have money or other resources to do what is calling to be done. We are more resilient and powerful than that and we have abundant resources available when we turn to look and when we continually offer prayers to the ancestors and ourselves in service of their bidding. This work of and in Membertou is another of the illustrations of how resilient we are as human beings, responding to the vision of what’s possible in the world. It is a time of quiet revolution and we are shifting the shape of the world as we know it. People who know me who are familiar with my life’s journey know that I have very few short stories. I have the most amazing, incredible and sometimes almost unbelievable stories of my life and 2010 was no exception. This year continued to bring some very big stories of experience into my life. 2010 has been a year of completion where I became aware that a five year deep transition period came to a close, opening up into a much gentler and no less transformative era of unfolding – one I hope endures into the rest of my life. This year has brought the deepest sense of trust in this life journey that I have ever experienced, searing into my awareness how much I am supported in the world and in my journey. I have been aware of this over the years but there was some associated doubt, worry and fear. No longer. I have landed with exquisite delight and amazing joy in this place of trust. When I do notice doubt, fear or angst lurking around the edges I know now to inquire into it and to ask for support to navigate my way through it with far more grace than I could have imagined possible. I have learned depth of relationship and the gift I have for creating the space for this by being open, vulnerable, curious, loving and open hearted. I have been gifted with depth and beauty of friendship by learning to be present and available for the relationship that is available to me, rather than wishing for relationship that is not. Highlights for 2010 include the Art of Social Innovation at Windhorse Farm in NS in April, moving into my new house in Bedford in May, attending ALIA in Halifax in June, visiting my sister and her husband on vacation with my youngest son in July, Warrior of the Heart training and the Art of Hosting Stewards gathering on Bowen Island in BC in August, Brazil, beautiful, amazing Brazil in October and then the Berkana Weaving the Web gathering in New York also in October, an invitation into a beautiful spiritual women’s circle in November. Permeated throughout all of these events or gatherings is the people, the rich friendships, people I love dearly who I also often have the good fortune to work with, some of whom I just met in this last year and others I have known for a very long time, all of whom I feel deep connection with. As this year draws to a close, my most enduring feeling is one of deep gratitude – for what has evolved and emerged in my life, for this new constant of joy and falling in love everyday, for my children who touch me deeply and from whom I learn lots, for my dad who loves me unconditionally, my mother who continues to show me the extent of soul journey on this earth, to my friends here and all over the world who have my back and I have theirs, to the shamanic journey that has characterized my path far more than I ever knew, for this deep sense of trust that is becoming ingrained in me, to sensing deeply into where I am supposed to go, what I am supposed to do and how I can best do that which is mine to do. I love how the shape of my life has shifted in this last year and I surrender fully into how it will want to shift in the coming years. For the beginning of 2011, I feel expansiveness and readiness – ready to accept more into my life in every conceivable way, ready to be of service to that which is mine to do, ready to nourish relationships I care deeply about and ready to receive all that is wanting to flow into my life.